Today's meeting was held at Alan's house. The first wine to be tasted was a Mont Rocher Carignan Vielles Vignes from the South of France. This juicy wine has a beautiful cherry red colour. The nose shows an abundance of intense red berry fruit and hints of vanilla flavours. The palate is soft, full flavoured with a smooth easy drinking finish. The fruit is sourced from vines around the village of Cruzy, sort of medium altitude in the western Hérault north of Narbonne, and the vines are 50 years old. Although this wine is made with an old traditional grape variety, the vinification was carried out in a modern style. The grapes are destemmed and crushed. The fermentation is carried out at controlled temperature, around 23°C . The ageing is carried out in tanks with a small amount of French oak staves to add more complexity and roundness to the blend. The wine was well received by the group, and everyone added it to their "like a lot" list. The wine can be purchased from Wadebridge Wines. The second wine tasted was a Canadian Ice Wine specially imported by Alan from a vineyard near to Niagara on the Lake. In Canada, Icewine must be produced exclusively from grapes that have been harvested, naturally frozen on the vine, and pressed in a continuous process while the air temperature is -8° Celsius (17.6°F) or lower. The Icewine harvest usually during the night to guarantee a temperature below -8° Celsius, done entirely by hand, commences once the temperature drops below -10° to -13° Celsius. Everyone agreed Alan's choice made an excellent pudding wine,however supplies are not readily available in the UK. Our latest expedition took us to Penzance. The Lerryn Minibus, driven most expertly by Lin, took 17 of us through the sea mist to Polgoon Vineyard and Orchards which sit on the south facing slopes above Penzance. We were expertly guided around the property by New Zealander Jeremy who entertained us all with his excellent knowledge. Our favourite part of course was the tasting of wines and ciders which followed. The Polgoon Shop has recently been updated and includes an excellent array of Cornish produce so thoughts turned to early Christmas presents too!! All in all a most enjoyable day in good company. Once again the weather was kind to us and we were able to enjoy our tastings on Helen's patio. Her garden re-modelling was well underway but we resisted the temptation to try out the mini digger! This month we stayed closer to home and tried out some Italian wines. Just to add a bit of spice to the afternoon we all rated our wines in secret and shared the scores at the end. First on the table was Falabella Bianco "a blend of mostly Trebbiano with the local Pecorino and Cococciola, where the crisp juiciness of a fresh apple meets the tang of lemon zest". Most of the group found the wine perfectly pleasant and were happy to have "seconds"! Nobody scored this 5 stars as per a recent newspaper review but the average score was about 3.5 to 4 stars. This was followed by a pale rose Poggioargentiera Rosato from the far south west of Tuscany. This is a blend of mostly Sangiovese with Cabernet Franc, and apparently should have "an intense tutti-frutti nose verging on boiled sweets". Most of the group were unable to agree with this! The scores at the end marked this wine down in the region of 2 stars. The bottle was empty by the end of the tasting however! We finished with a red of course, a Valpolicella from Cantina di Negrar in the region of Verona, north east Italy. The tasting notes told us to expect "Juicy red berries and red fruit aromas exploding from the glass accompanied by summer berries, exotic spices and a hint of earth" and actually that was a pretty good description! Our scores were up in the 4 and 5 star region, even from those who don't normally drink reds. A very pleasant afternoon was had by all and we were interested to try some wines which we would not normally have in our collections at home. This month's gracious host, Ronald, chose to take us to the other side of the world for the afternoon – Oyster Bay at the northern tip of New Zealand's South Island. 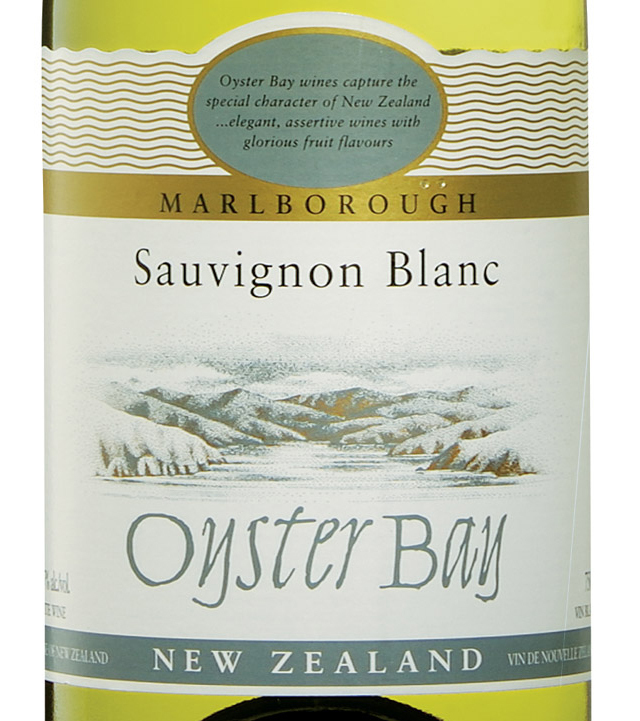 We tasted a Sauvignon Blanc which was characteristic of this style of New World wine – lively tropical and gooseberry flavours, followed by a Pinot Noir which we all felt was a very “quaffable” light red perfect for summer drinking. We were pleased to be joined by Linden's son David who is a “flying winemaker”! He had recently finished an assignment in New Zealand and was able to tip us off that 2013 looks like being a fantastic year for Sauvignon Blanc from that region. As ever the afternoon passed with some lively debate on a variety of topics. We also learnt a number of useful facts if you ever go to quizzes! Did you know that Kia ora is a Maori greeting meaning be well/healthy? Or that pinot grapes get their name from the pine cone shape in which the bunches grow? Clever stuff this U3A learning! They say the sun shines on the righteous, but today it shone on the Wine Appreciation group as we enjoyed a sunny afternoon in Lerryn with this month's hosts Lyn and Rob. We started with a link to Cornwall - the wine was from Tamar Ridge near Launceston ..... In Tasmania! The Kayena Vineyard Gewurtztraminer. This grape is normally found in Germany and Alsace but as it prefers cooler climates it is suited to Tasmania. The winemaker tells us "This Gewurztraminer has a bright straw colour with green tinges. The nose is showing an array of fresh rose petals, spiciness and tropical fruits including paw paw and guava. It has ripe mouth filling flavours of tropical fruits and spices with a fresh zesty acidity finish. The skins contact has also added extra elements, including a touch of oiliness, which enriches the mouth feel"
As ever there were differing views as to the wine but most of the group agreed that we found the price tag of £13 a bottle a little too much! We then moved on to an unusual red grape... Carmenere. This grape became extinct in France following the fungus oidium and phylloxera epidemics in the mid 1800's. it was later found to have been planted in Chile where they were using it as a Merlot grape. Today it is available as an everyday drinking wine from Cono Sur Vineyards at about £7.50 in most supermarkets. But the best was saved until last. Rob makes his own cider in the garage from apples in his garden. We all agreed it was a delicious dry cider and wended our weary way home! This month's meeting was hosted by Christine who was inspired by the recent sunny weather to tempt us with a couple of rose wines. Firstly we went on a nostalgia trip and opened a bottle of Mateus Rose which none of us had tasted in many, many years! In fairness the "recipe" does seem to have improved somewhat since it was first launched as a brand in the mid 1940's .It was relaunched in 2002 and now retails for £5.99. Several stories of experiences in our misspent youth were exchanged! We then brought ourselves up to date with a bottle of Australian Rose, Wombarra Shiraz Rosé 2010. (Available from larger branches of The Co-Op.) This was a glorious colour, with very strong cherry notes on the nose and palate. As this also retails at £5.99 we all felt we would rather spend our money on this bottle rather than the Portuguese offer! The fact that this is 13.5% abv rather than the 11% Mateus tells us how rose wine has changed in 70 years. An intrepid group of U3A members set off for Falmouth on the train with a hint of sun in the sky at last. Having enjoyed a leisurely lunch we made our way to Majestic Wine Warehouse where we were treated to a Wine Course by their manager, Andy. We started with a French Sauvignon Blanc, moved on to a Chablis and an Argentinian Chardonnay. Then came the overall winner Heidsieck Gold Top Vintage Champagne, which we all enjoyed a second glass!! Then on to the reds. Firstly a Pinot Noir and then two Cabernet Sauvignons, one from France and one from Australia. We had been advised to save some of each wine as we tasted, and that was because we were then given a plate with morsels of food to try with different wines. We all found this very interesting and changed our minds on certain wines once we had food with them. Finally we tasted a French Sauternes with a morsel of blue cheese and all declared it delicious!! There was just time for us to place a few orders before returning to the station for our late afternoon train, all feeling very mellow! Report on meeting Monday 25th March 2013 - To decant or not? Today the group blind tasted 2 bottles of Ariki Reserva Colchagua Carmenere Cabernet Sauvignon 2011. One had been decanted 7 hours ago, the other was opened there and then. As the bottles were covered we all assumed we were drinking two separate wines - you had us fooled Alan! It was agreed that there was a definite difference in the taste between the two bottles, the one that had been decanted was much smoother on the palate. The Group tasted a bottle of The Gooseberry Bush 2012. A vibrant South African Colombard/Sauvignon blend from the Bruwers family estate Nestled between the Breede River and the Langeberg Mountains. The wine was well received by all members present. Repeat orders are being placed! !